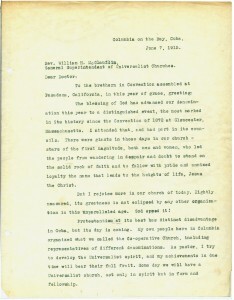 In addition to reports and programs, however, the archival record of the Universalist General Convention of 1915 gives a sense of the excitement and uniqueness of this event through letters sent to the convention as well as photographs of the event. Photo 1. 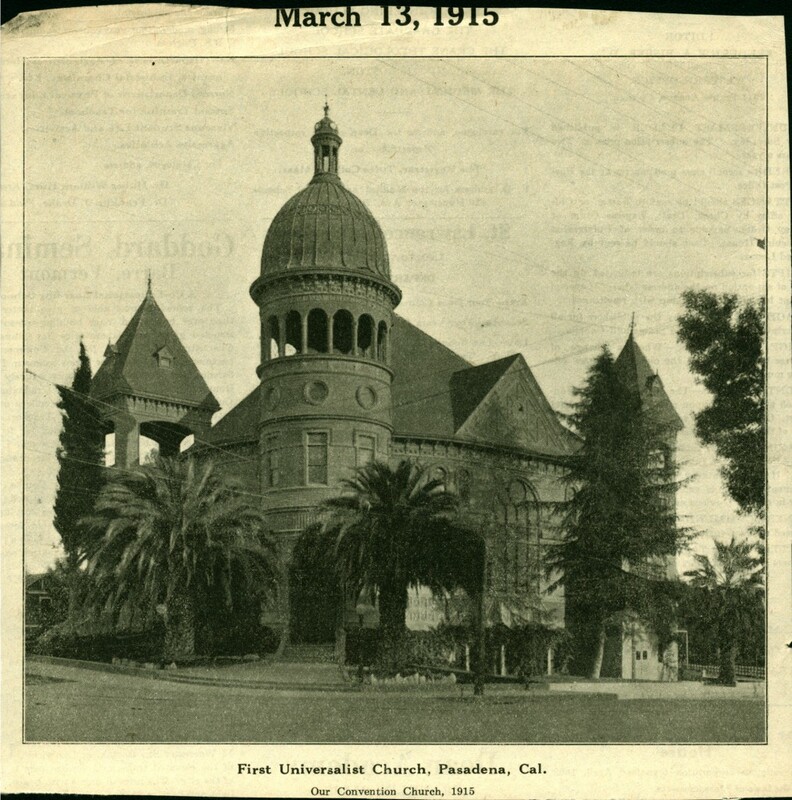 General Universalist Convention, Pasadena, 1915. Courtesy of the Andover-Harvard Theological Library. Photo 2. 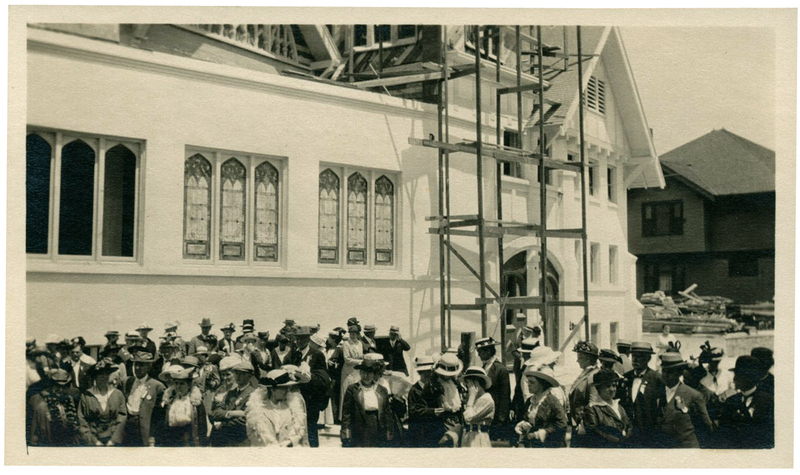 Universalist Convention at St. Mark’s Church, Los Angeles, under construction. July 6, 1915. Courtesy of Andover-Harvard Theological Library. 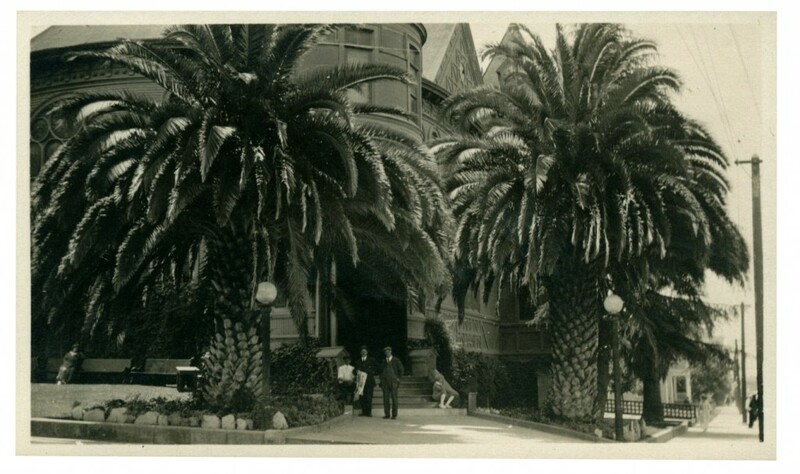 Photo 2, reverse. 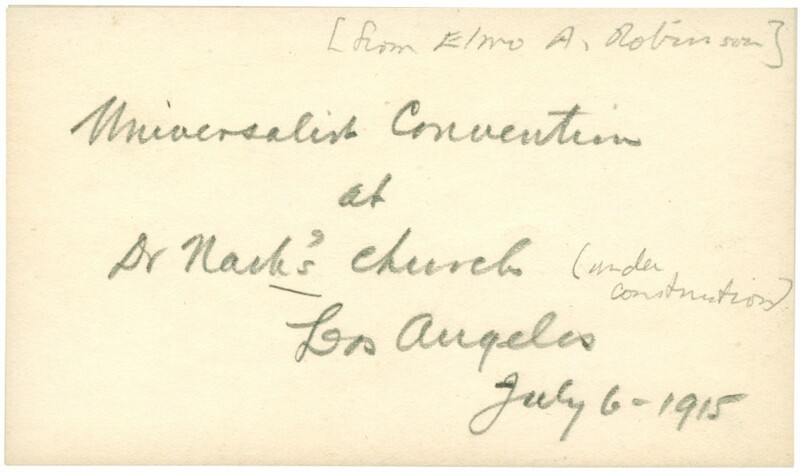 Universalist Convention at St. Mark’s Church, Los Angeles, July 6, 1915. 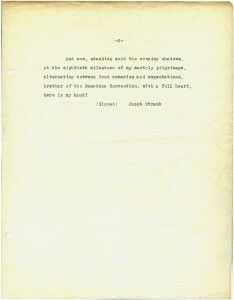 Courtesy of Andover-Harvard Theological Library. Photo 3. Universalist Church, Pasadena, CA, July 1915. Photo by Elmo Robinson. Courtesy of Andover-Harvard Theological Library. Photo 3, reverse. 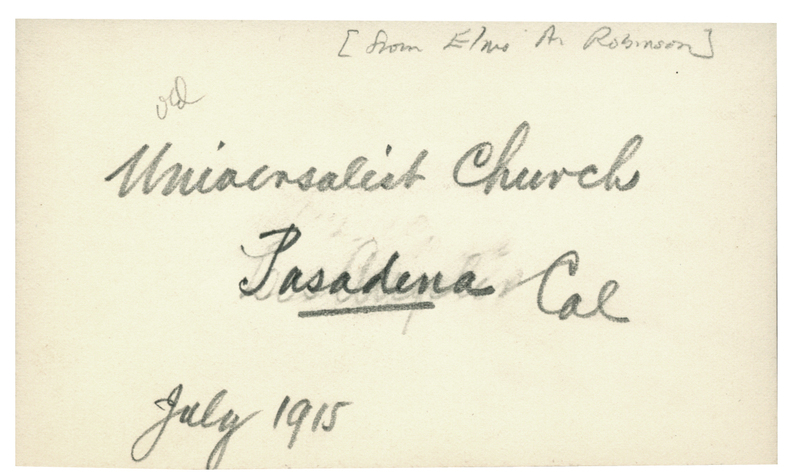 Universalist Church, Pasadena, CA, July 1915. Photo by Elmo Robinson. Courtesy of Andover-Harvard Theological Library. 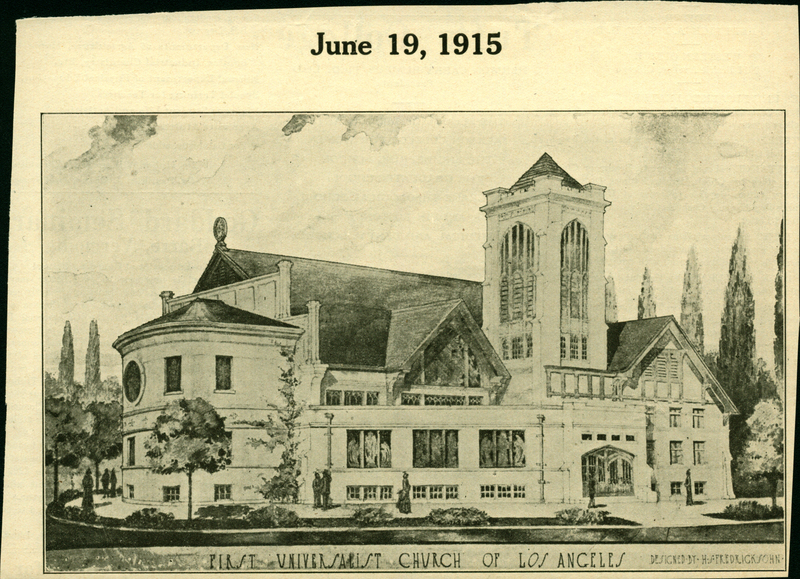 First Unitarian Universalist Church of Los Angeles. Courtesy of Andover-Harvard Theological Library. Courtesy of Andover-Harvard Theological Library. 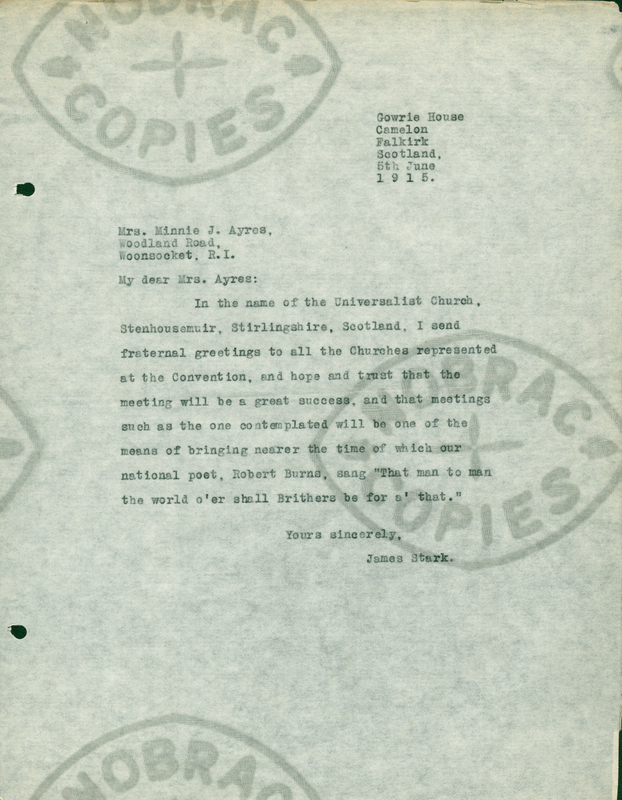 The Universalist General Convention received formal letters from all over the world (comparatively! ), attracting words of greeting and good wishes from places as far away from Pasadena as Scotland, Nova Scotia, and Cuba. The letters also indicate some of the international reach of American Universalism in the early twentieth century. 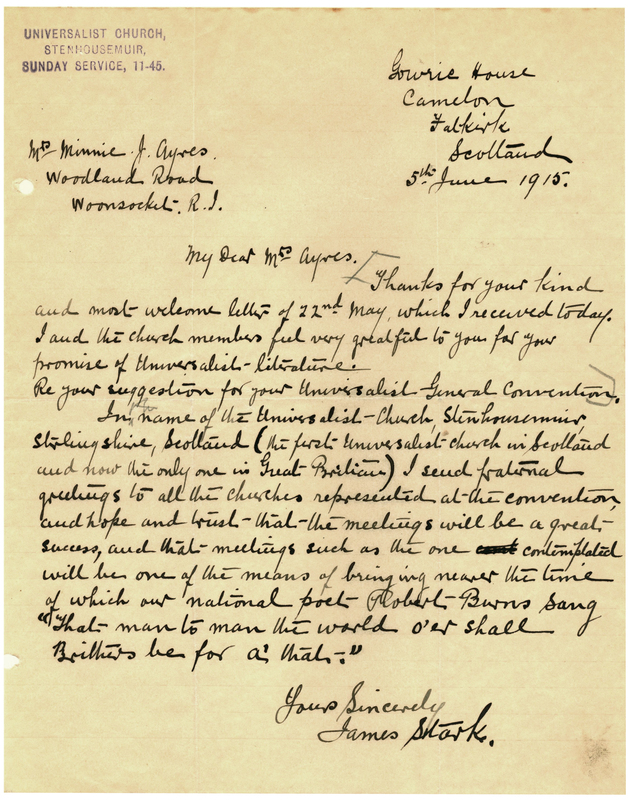 To view a letter in a larger size, click on it to expand. 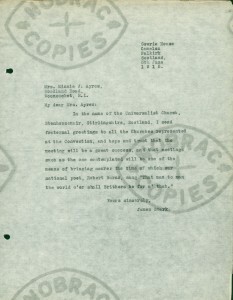 Letter 1 from James Stark of Scotland to Mrs. Minnie Ayers, of Rhode Island. Courtesy of Andover-Harvard Theological Library. 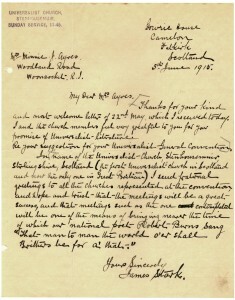 Letter 2 from James Stark of Scotland to Mrs. Minnie Ayers, of Rhode Island. Courtesy of Andover-Harvard Theological Library. 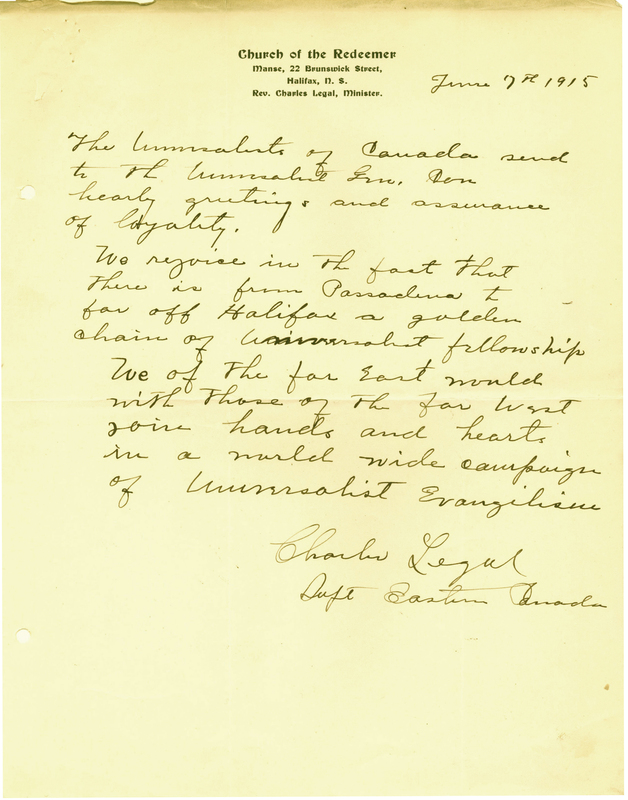 Letter from Charles Legal of Nova Scotia. 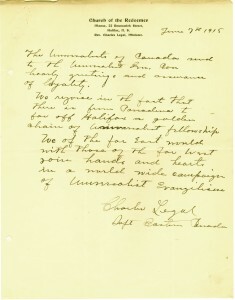 Letter from Charles Legal of Nova Scotia. Courtesy of Andover-Harvard Theological Library. 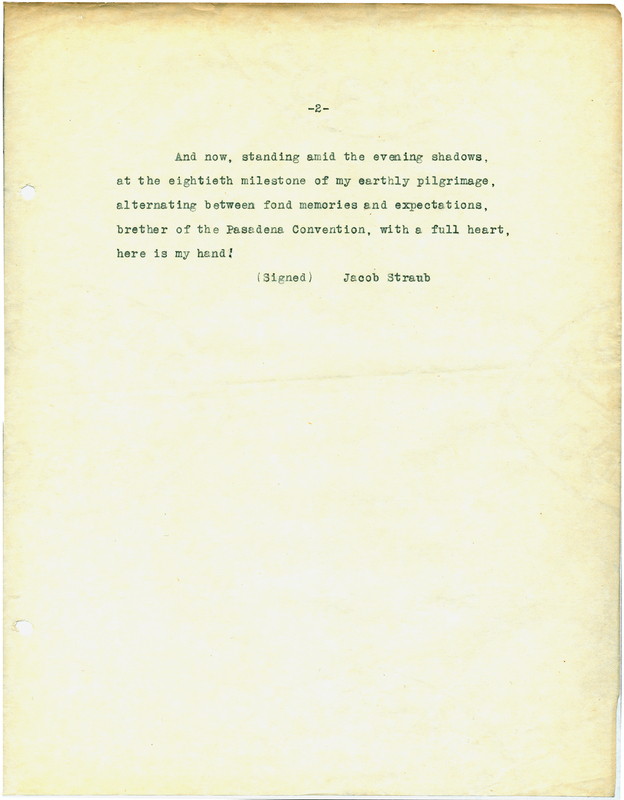 Page 1 of letter from Jacob Straub of Cuba to the Universalist General Convention. Courtesy of Andover-Harvard Theological Library. 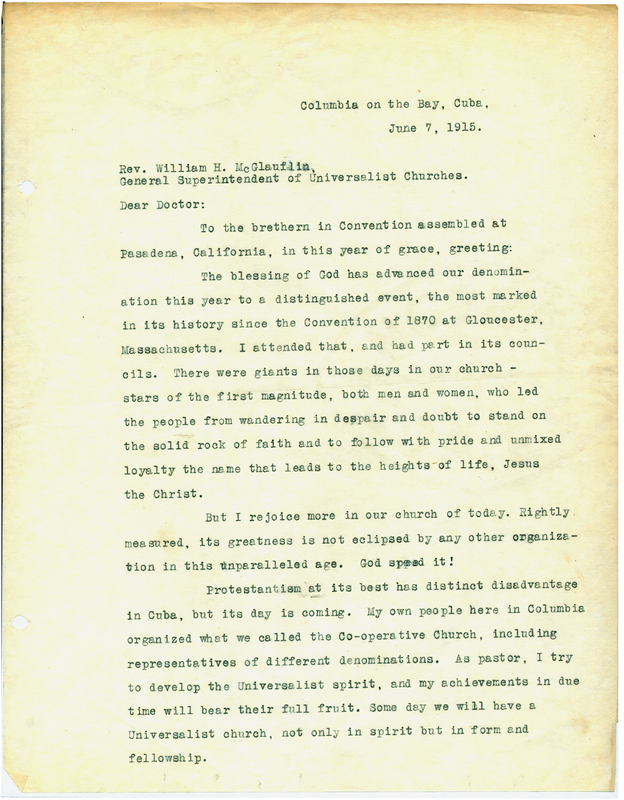 Page 2 of letter from Jacob Straub of Cuba to the Universalist General Convention. Courtesy of Andover-Harvard Theological Library.